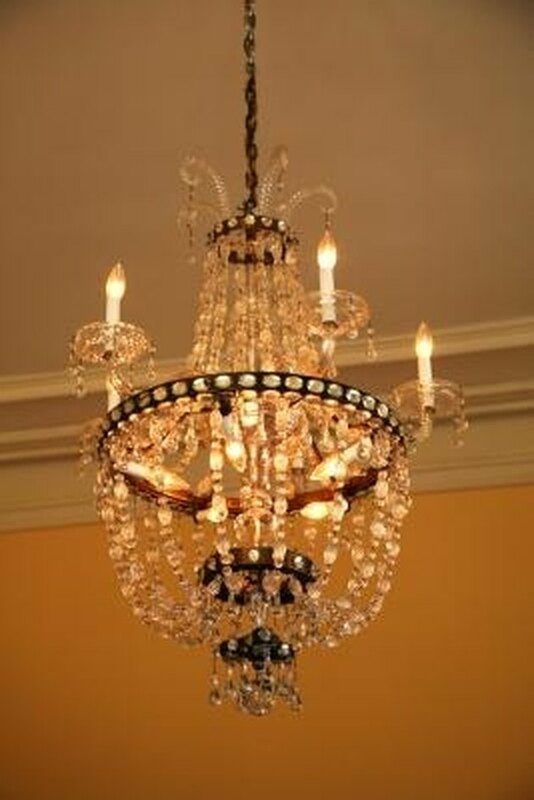 While individual chandeliers differ from manufacturer to manufacturer, most traditional chandeliers are constructed from the same types of parts -- often brass and crystal -- and have similar silhouettes. This fact allows some generalizations to be made about how to assemble the majority of chandeliers. If you brought a chandelier home but left its assembly instructions behind or lost them, you can still put together your lighting fixture without scouring the Internet for the model's specific instructions. Make alterations to the assembly process as you familiarize yourself with your specific model. Many chandeliers are constructed in roughly the same configuration. Slide the canopy onto the chain. Feed the two electrical wires through the chain, passing through every third or fourth link. Thread one end of the wires through the canopy. Feed the other end of the wires through the chandelier's base. Attach the wires to the wires inside the base; the wires you connect them to should be visibly different from the arm wires, which you will thread through the chandelier's arms. Twist them together if no other connection method is apparent, and remember to connect like colors. Cover the connections with wire nuts. Thread the chandelier's arm wires through the holes in the base, one in each hole. Strip 1 inch off the end of all emerging wires. Thread them through the arms, and then attach the arms to the base. Wrap the ends of the wires around the two screws on the sides of the sockets at the end of the arms; wrap each wire in the opposite direction from the other wire. Cover the sockets with the tube-shaped candle covers. Screw on the bottom finial or ball to cover the opening at the underside of the chandelier. Attach any crystals or decorative chains with the included hardware. Add light bulbs after you successfully hang the chandelier.